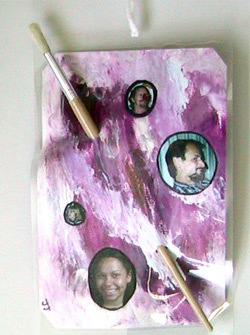 This painting-with-a-paintbrush represents the painting support group Ive been going to. The paintings Ive done there have tapped into my subconscious and helped me express my emotions concerning my cancer. The photographs you see on this object are the friends and family who have been there for me  and still are  during my ordeal with cancer.